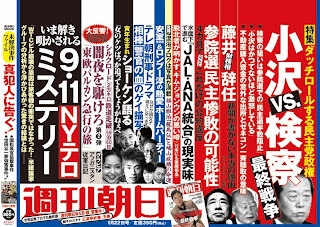 TOKYO - A LAWMAKER and foreign policy expert of Japan's centre-left ruling party Tuesday denied telling The Washington Post that he suspects the September 11, 2001 attack on New York was a hoax. In an editorial Monday, the US newspaper said Yukihisa Fujita, a lawmaker of Prime Minister Yukio Hatoyama's Democratic Party of Japan (DPJ), had questioned that the attacks were the work of terrorists. Yumi Kikuchi, a well known peace and 9/11 activist first presented a video lecture that had been prepared by co-author of the book, Akira Doujimaru, who lives in Spain and was not present at the event. The presentation explained in great detail the numerous main points that completely contradict the official 9/11 account of the US administration and the mainstream media. It was made clear that 9/11 is used to constantly justify wars.